The unconventional bride-to-be is arguably one of the most exciting. You can’t quite compare her taste to anything or anyone else, which means she is the ideal candidate for a unique engagement ring setting. The more traditional brides usually appreciate classics like emerald, pear and oval cuts or a simple solitaire with a halo or even the added sparkle of baguettes. That’s beautiful. But, for the non-traditional bride, traditional aesthetics just won’t do. The unique brides are more likely to pick silicone rings over solid gold, because traditional just isn’t their style. The unique bride is the one who embraces those rare finds that you’re not going to come across in most jewellery displays. That’s why it’s important to present her with a design she just wouldn’t expect. This goes somewhat beyond just a once-off setting or coloured stone. It’s about getting an extreme wow-factor just right – something so fantastical that shows off remarkable artistry and innovative design. What Type of Engagement Ring Settings Should You Choose for Your Unique Bride? So, what kind of engagement ring could you choose for your one-of-a-kind partner? A trillion-shaped diamond set amongst a formation of emerald-cut baguettes would certainly do the trick. Or, how about a dramatic wrap ring with marquise, pear and round diamonds set in 18K white gold? Or why not think about getting a bespoke ring made? Companies like Elegantgems.ie do just that. It will be a one off and something special to share between you and your partner. Sapphire engagement rings, be they pink, yellow or blue make a very special choice. And, since sapphires tend to be scratch-resistant and very hardy, they tend to hold up really well to daily wear. They also pair well with diamonds and work in a range of settings. What’s more they stack nicely with other bands, too, like anniversary bands. You may also want to think about choosing a ring with your bride-to-be’s birthstone as a way of celebrating your love. It’s a beautiful statement for a beautiful bride. Wedding and engagement rings that showcase intricate design details, be it an elaborate pattern, nature or flora-inspired motif, special heritage symbols or even dual tone precious metals are a great way to create a personal and highly unique look. The Diamond Jewellery Studio are among the reputable jewellers in Brisbane with a range of unique engagement rings. For a truly special look, sift through antique engagement rings. These rings usually feature details you won’t find on modern rings, like milgrain and engraving, and often they sport pearl accents or coloured gemstones in rings from earlier eras. One sure-fire way to ensure the most unique engagement ring for your partner is to create a custom design. Reputable jewellers will work with you to design whatever you and your bride-to-be have in mind. If you can conjure it up in your mind, you can have a one-of-a-kind design created. They do beautiful custom wooden rings at Northwood Rings if you’re going for a more unique, natural look. Your partner’s extraordinary style probably feels like a tall order, and perhaps even a costly one. Bu, truth be told, many unique engagement rings or custom-made varieties don’t have to cost a complete fortune. If you are on a budget, going for a cluster silhouette, contemporary shape or a gemstone instead of a diamond can help to keep costs down. And they’re just as impactful. 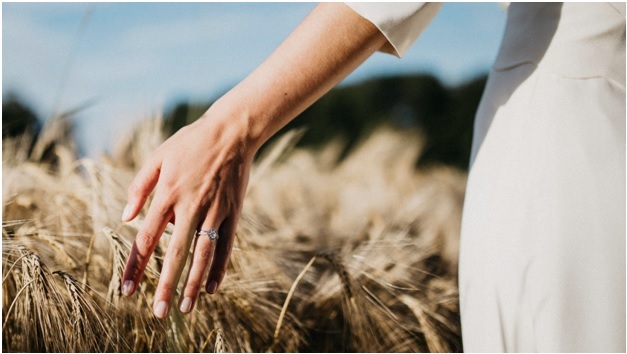 No matter how unconventional your bride-to-be may be, you can find stunning and rather unexpected engagement ring settings on the market, or you can have one made specially.